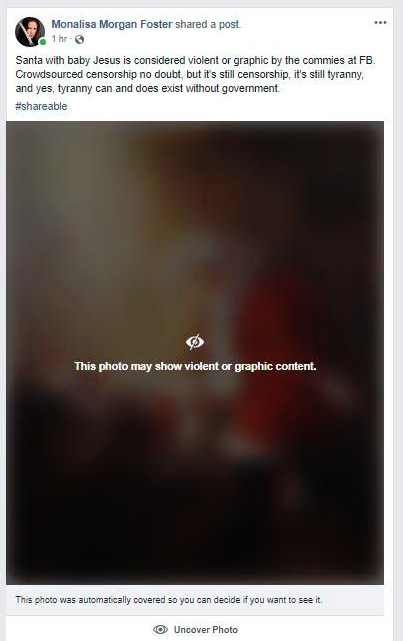 Facebook has censored a photo of Santa Claus kneeling in baby Jesus's manger because, according to the guidelines, the photo may "show violent or graphic content." According to LifeSiteNews, the photo was previously covered up by a banner that read "may show violent or graphic content." Underneath the ominous warning, users had the option to "decide if [they] want to see it." According to Facebook, "violence or graphic content" is defined as an image some people might find objectionable. "We ... know that people have different sensitivities with regard to graphic and violent content," a portion of Facebook's Community Standards reads. "For that reason, we add a warning label to especially graphic or violent content so that it is not available to people under the age of eighteen, and so that people are aware of the graphic or violent nature before they click to see it." The guidelines add, "We err on the side of allowing content, even when some find it objectionable." At the time of this writing, the banner has been removed. User Monalisa Morgan Foster shared the photo on Wednesday, before Facebook uncensored it. She wrote, "Santa with baby Jesus is considered violent or graphic by the commies at FB. Crowdsourced censorship no doubt, but it's still censorship, it's still tyranny, and yes, tyranny can and does exist without government." Another user, Lori Cockerill Edmondson, had the same issue with the photo on Wednesday. She wrote, "WOULD SOMEONE PLEASE HURRY UP AND CREATE A SOCIAL MEDIA NOT RUN BY SJWs?!!!?" "A friend of mine just posted this and it was blurred with the admonition, 'This photo was automatically covered so you can decide if you want to see it.' What the mess?" the user added. "So has Zuckerdude decided that anything Christmas might be offensive?" According to the outlet, the post was originally shared on Dec. 1, 2015, and it's been making rounds on the social media network since. My dear precious Jesus, I did not mean to take your place, I only bring toys and things and you bring love and grace. People give me lists of wishes and hope that they came true; But you hear prayers of the heart and promise your will to do. Children try to be good and not to cry when I am coming to town; But you love them unconditionally and that love will abound. I leave only a bag of toys and temporary joy for a season; But you leave a heart of love, full of purpose and reasons. I have a lot of believers and what one might call fame; But I never healed the blind or tried to help the lame. I have rosy cheeks and a voice full of laughter; But no nail—scarred hands or a promise of the hereafter. You may find several of me in town or at a mall; But there is only one omnipotent you, to answer a sinner's call. And so, my dear precious Jesus, I kneel here to pray; To worship and adore you on this, your holy birthday.